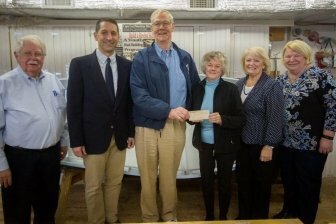 The Barnstable Association For Recreational Shellfishing , Inc. (BARS) has donated $1,000 to Hyannis Support Our Youth, Inc. (HySOY) and the Cape Cod Maritime Musuem. BARS is dedicated to the protection, preservation, and propagation of shellfish in Barnstable County. Hyannis Support Our Youth, Inc. (HySOY) in conjunction with the Cape Cod Maritime Museum (CCMM) will provide mentoring, early literacy, and youth enrichment opportunities to the children of Barnstable. “BARS is extremely proud to be able to provide support to these worthwhile community organizations. The CCMM through its enrichment opportunities programs will further BARS mission to understanding the sea”, said Norman Wilson, BARS President. HySOY is, “Greatly appreciative of this generous gift from BARS in supporting our youth initiatives”, said Moira Bundschub, Hysoy Director.